With 1,000 L.A. area hikes published on the site, I am proud to introduce a new series of write-ups featuring hikes outside of southern California. For the past two years I have had the good fortune of being able to visit Kauai, Hawaii and do some terrific hiking. 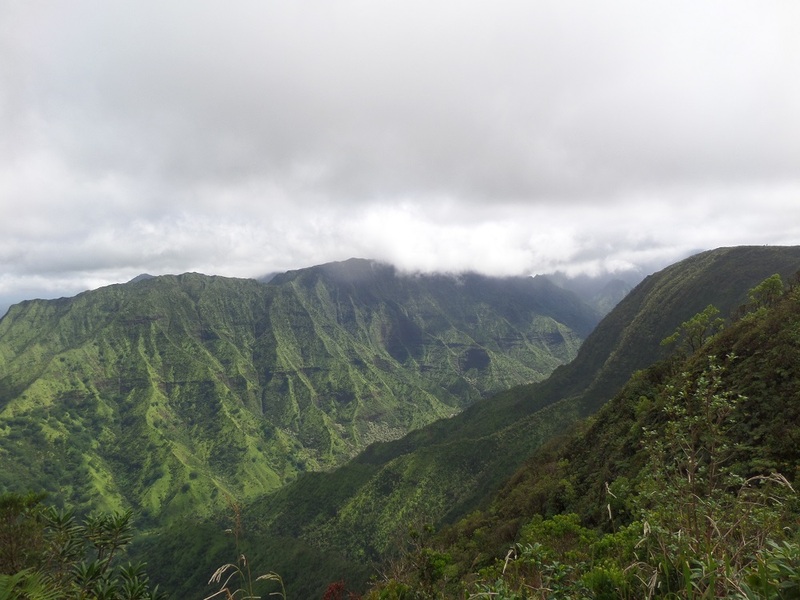 This write-up will discuss three trails in Koke’e State Park, a neighbor of Waimea Canyon, the “Grand Canyon of the Pacific.” They are the Awa’awapuhi Trail, the Kilohana Lookout via the Pihea and Alaka’i Swamp Trails and Waipo’o Falls via the Canyon Trail. Getting to Kauai: A few nonstop flights are available from LAX to Lihue. (If you are coming from SNA, ONT, BUR or LGB, expect to have to change planes in Maui or Oahu). The flight is about 5 hours. Hawaii is 2 hours behind Los Angeles from November to March and 3 hours behind for the rest of the year as the state does not observe Daylight Savings Time. Staying on Kauai: Camping is available at Koke’e State Park starting at $12 per night. Here is a description of the camping experience. For information about non-camping lodging on Kauai, click here. Weather: Though the island is relatively small (at 552 square miles, it’s slightly larger than the city of Los Angeles) Kauai has a huge variety of weather. The town of Waimea, at the mouth of Waimea Canyon, usually averages about 20 inches per year (L.A. averages 15) while Wai’Ale’Ale Mountain, only a few air miles away, registers 440 – making it the second wettest place on earth. 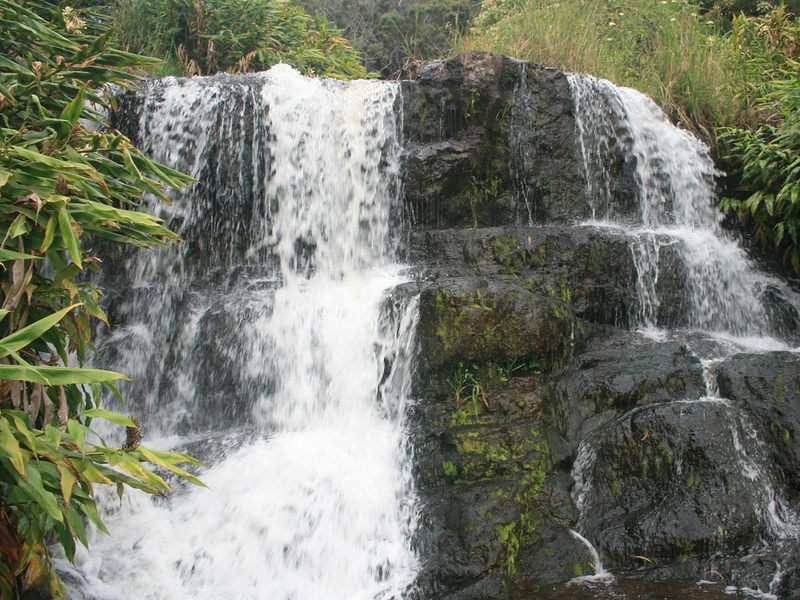 Koke’e State Park receives an average rainfall of 70 inches per year. In addition to muddy trails (some of which are fitted with netting to help with traction) you will also be dealing with a lot of humidity. Two of the hikes described below are “reverse” hikes (down then up) and the third also has some significant elevation gain on the return, so plan accordingly. In my personal experience, the hikes took between 25 and 50% longer than L.A. hikes of comparable distance and elevation gain. The temperatures are pretty consistent throughout the year, usually ranging from the high 40s to the high 60s. Summer months tend to get less rain than winter. 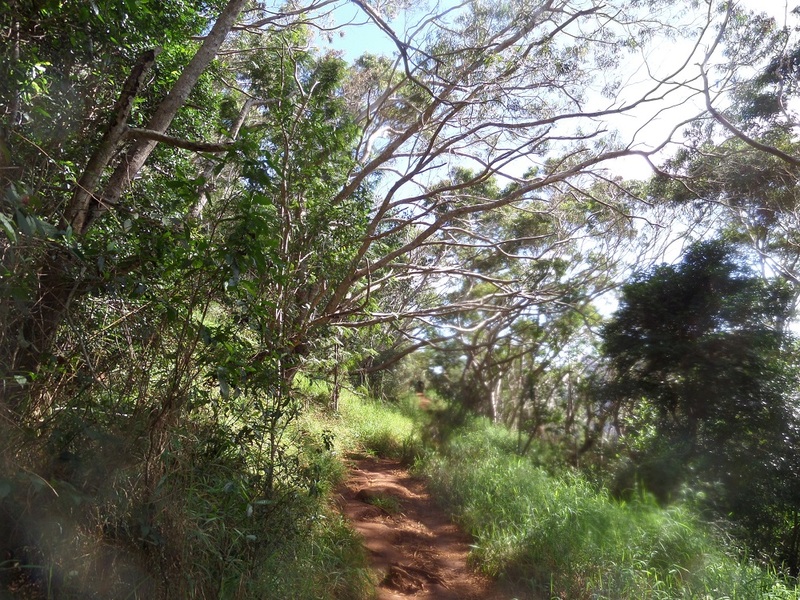 Cell phone reception: The developed areas of Kauai (mainly along the coast) typically have reliable cell phone reception, but don’t count on it when you’re on the trails. Dogs: Bringing pets into Hawaii requires an elaborate process that must be started at least 120 days in advance. If you are unable to bring your dog from home, you can borrow a dog for the day from the Kauai Humane Society in Lihue. Dogs are allowed on leash at Koke’e State Park. Exercise caution on warm days and be careful around steep cliffs. If you are in a rental vehicle, make sure you check the company’s dog policy. 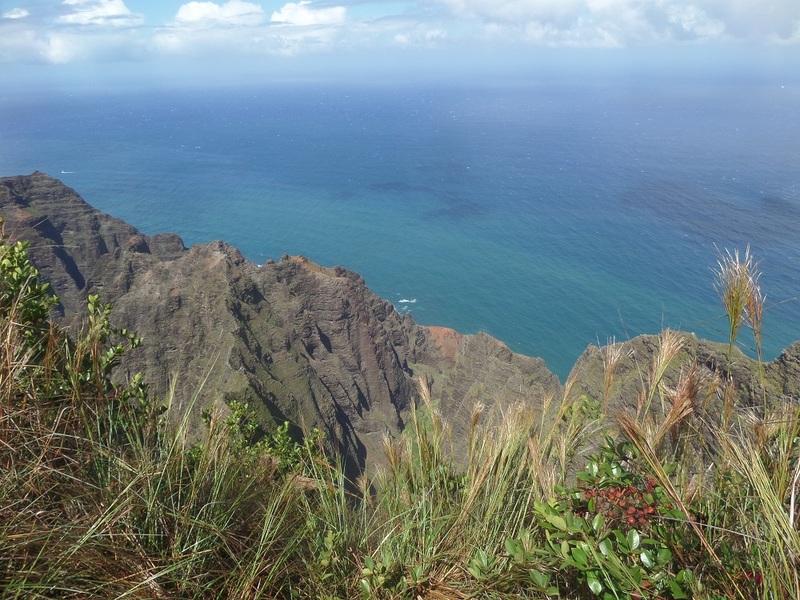 If conditions are ideal, this is one of Kauai’s best day hikes, featuring a vista point with outstanding views of the island’s northwest shore. 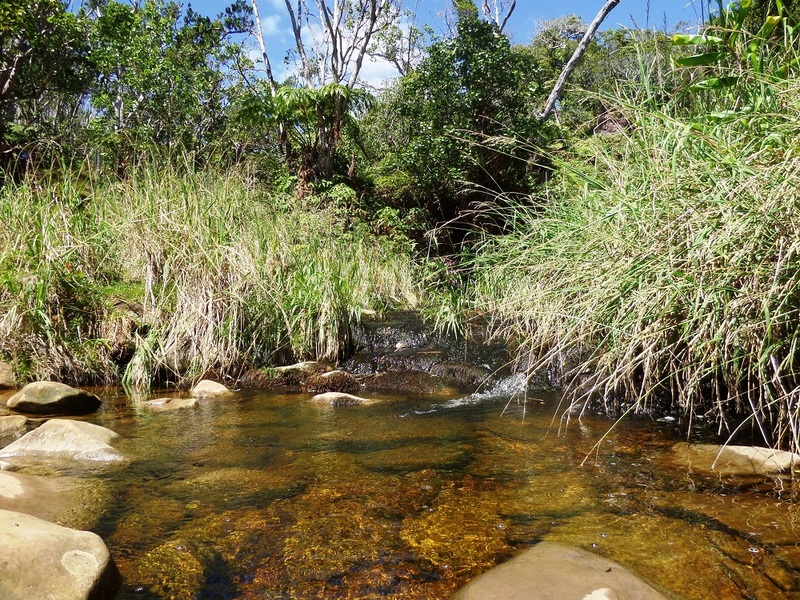 The trail can get muddy if there has been recent rain and on hot days, the return trip (climbing some 1,600 feet) should not be underestimated, but with good planning and a little bit of luck, the Awa’awapuhi Trail is a seminal Kauai hiking experience. The trail starts out innocently enough, leaving from the parking lot and briefly heading uphill through a thick forest (plaques identify some of the local trees) before beginning the main descent shortly after the half mile marker. At about 1.25 miles the trail exits the woods and previews the coastal scenery that is to come. The next mile or so is in and out of shade and after a few tight switchbacks, you reach a junction with the Nu’alalo Cliffs trail (currently closed due to hazardous conditions.) The Awa’awapuhi trail continues about 0.3 mile to its ending at two vista points, a site featured in the movie Six Days and Seven Nights. Both views – the Nu’alolo Valley on the left and the Awa’awapuhi Valley straight ahead – are memorable. The cliffs abruptly drop 2,000 feet to the valley floors and the ocean. Tiny shapes of touring helicopters and boats can be seen far below. Formidable metal railings separate you from the edge. Whether you want to go past the railing and follow a narrow ridge to its end depends on how much you are willing to risk for a selfie. Many hikers will likely want to enjoy the views from the safety of behind the railing before making the long climb back uphill. There aren’t many hikes that visit forests, high altitude wetlands, a mountain stream and culminate in a lookout with panoramic ocean views, but the hike from the Pu’u O Kila lookout to the Kilohana Lookout in the upper reaches of Kauai’s Koke’e State Park does all of the above. Hikers who are willing to drive all the way to the end of Koke’e Road and don’t mind getting dirty (the trails get very muddy following rain and it rains a lot in this area) are rewarded with this unique adventure. The views from the trail head at the Pu’u O Kila lookout are outstanding, making this a popular destination even for non hikers. 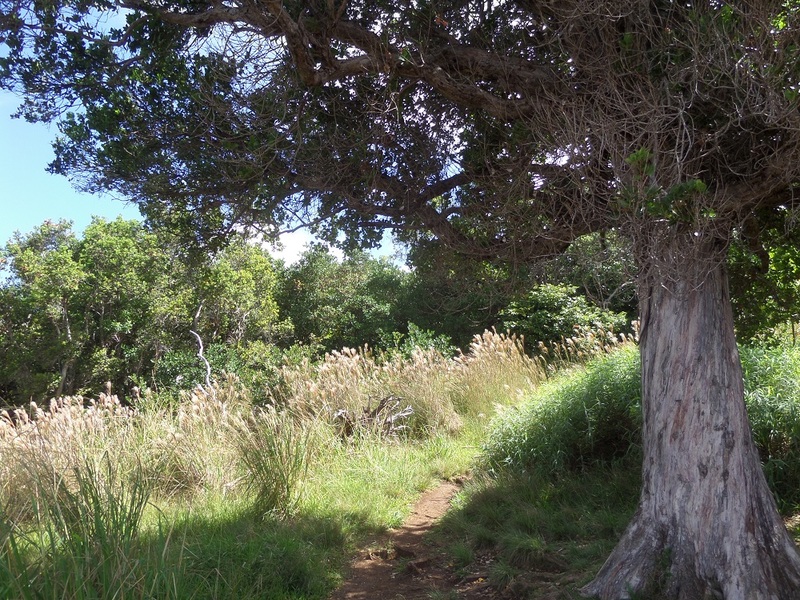 The Pihea Trail descends steeply from the lookout, following a roller coaster-like ridge. Some casual hikers explore a little ways down the trail before returning to the parking area. 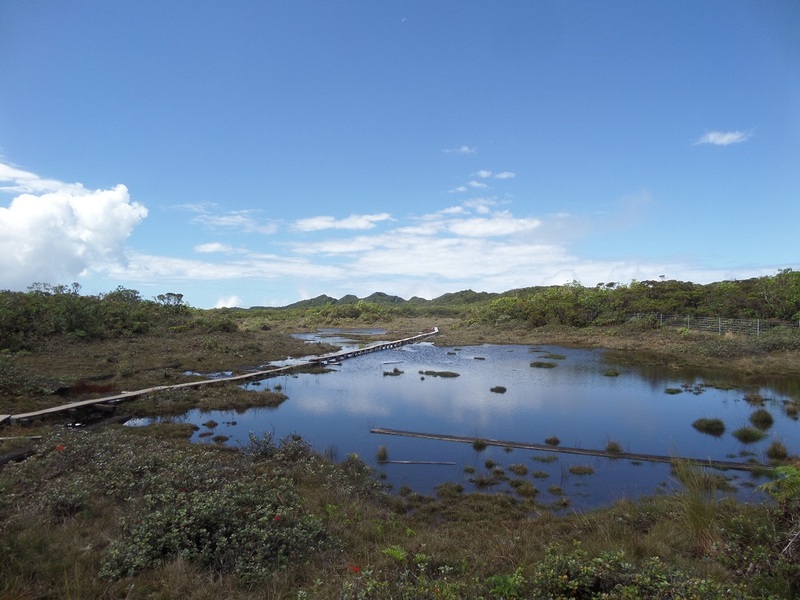 The hikers who are returning from longer trips – on the Pihea and Alaka’i Swamp Trails or other routes in the area – are likely have more mud on their clothing. 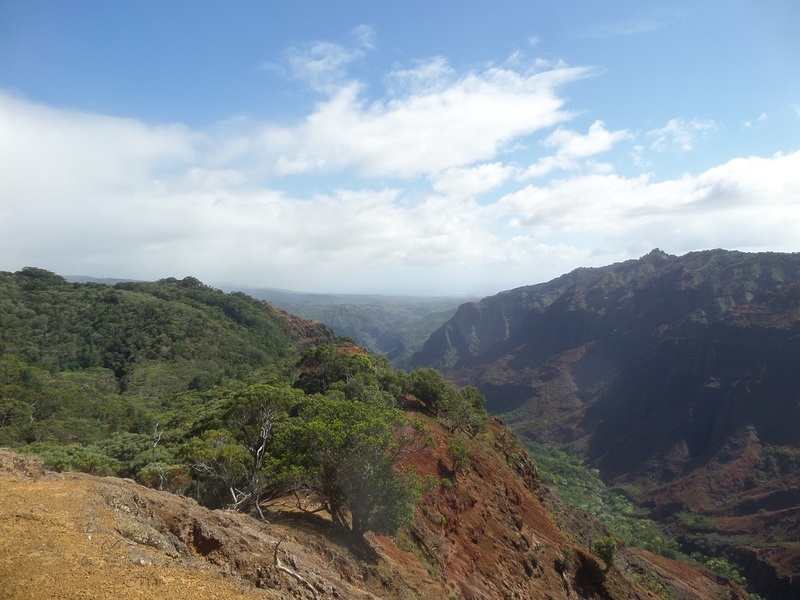 The first mile of the Pihea Trail features views of the Na’Pali Coast to the north and the lush upper reaches of Waimea Canyon to the south. A few boardwalks help out with footing but the trail can still be very muddy and slippery. One mile from the start, you reach a junction. 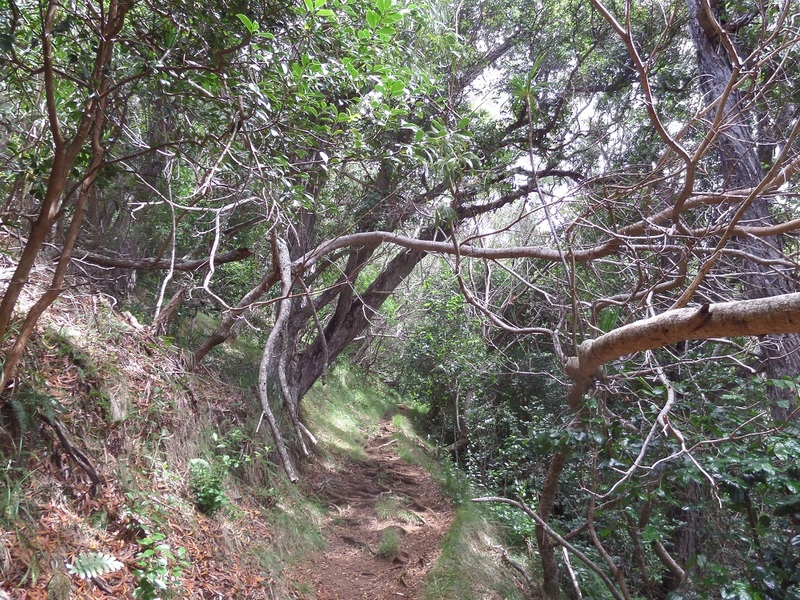 A short but steep spur on the left leads to a vista point while the Pihea Trail continues to the right, heading sharply downhill. A fence provides useful handholds and at the bottom of the slope, you enter a wooded area where the trail becomes a boardwalk. For the most part the boardwalk makes life easier – but don’t get too comfortable. Metal netting on the boardwalk, intended to provide traction, does so – but also can become a tripping hazard as some pieces have come loose from the wood. The wood itself has rotted out in some places, leading to missing steps. At 1.7 miles from the start, you reach a 4-way junction. 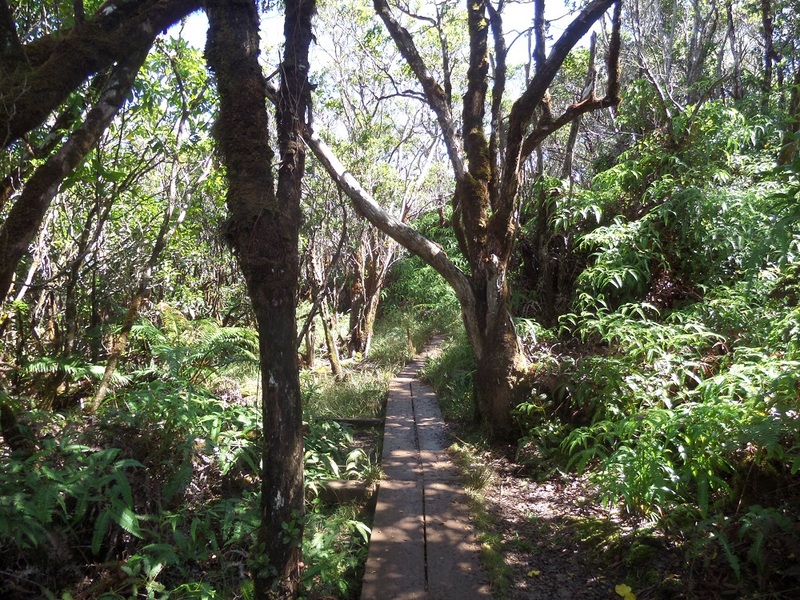 Take a hard left onto the Alaka’i Swamp Trail and follow it through the woods to a staircase. After descending the stairs, you are rewarded with a pleasant surprise: a mountain creek (a tributary of Kawaikoi Stream). This is a perfect spot to rest for a little while – and wash off some of the mud you may have accumulated. The trail continues by climbing out of the canyon, now without the benefit of the boardwalk, soon reaching the Akala’i Swamp. The boardwalk returns, carrying you over the wetlands past multitudes of short trees. Some of the boardwalk’s original segments from the late 1990s still remain intact while in other areas it’s been replaced by a less attractive but more durable Ikea-like composite. Despite the boardwalk, there are going to be a few spots where it’s hard not to get muddy. Near the end of the trail, the boardwalk crosses a wide pond. By this point you may hear the voices of other hikers at the lookout. The Kilohana Lookout, the trail’s terminus, is little more than a small clearing at the edge of the mountain, but the views are tremendous. Hanalei Bay stretches out to the north while deep, lush canyons yawn to the east. Silver strands of distant waterfalls make their way down the green slopes across the chasm. After enjoying the view, retrace your steps back to the Pu’u O Kila lookout. The return route has slightly more elevation gain (700 feet total, compared to 500 outbound) but in wet conditions, uphill can actually be easier. 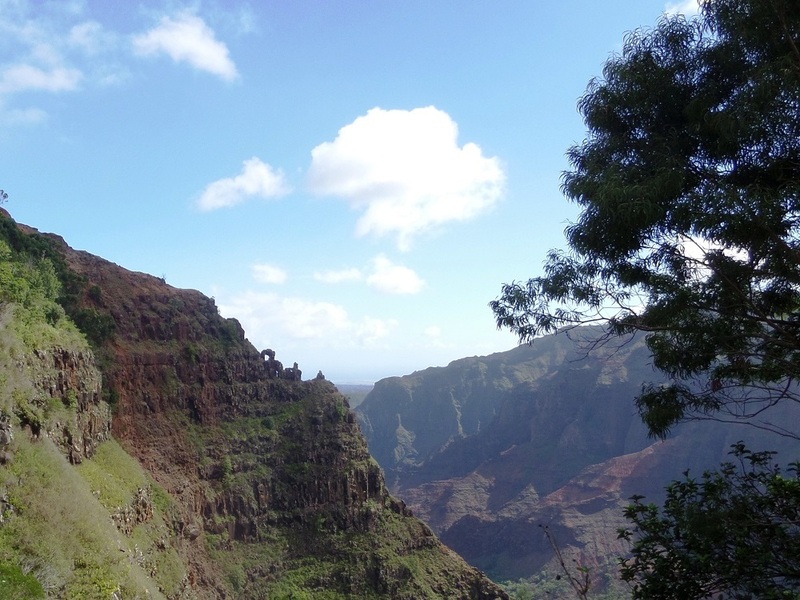 This is one of Kauai’s best shorter hikes, providing dramatic views of Waimea Canyon and bringing hikers to the edge of one of the island’s major waterfalls. To be sure, the best views of Waipo’o Falls are found farther south at the Waimea Canyon Lookout, but this hike still offers plenty of challenges and a variety of outstanding scenery. It begins tamely enough, leaving the Pu’u Hinahina Lookout as the New Spur Trail, level at first and then gradually descending. Soon the drop becomes steep and loose in some areas, making for a challenging trek both coming and going. After crossing Halemanu Stream, the trail ascends a slope that can become slippery if there have been recent rains (and Waimea Canyon gets a lot of rain). The trail passes by a junction with a dirt road (an alternate trail head for 4WD vehicles). 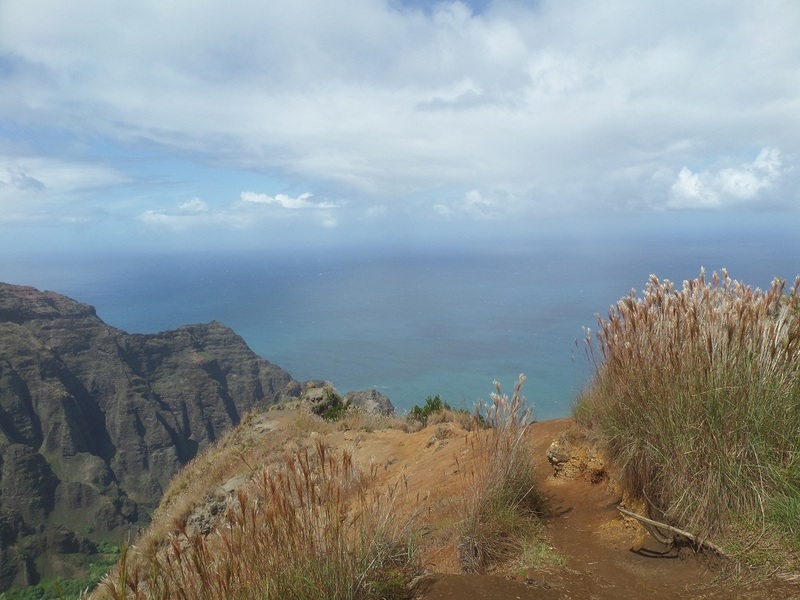 You then reach the Cliff Lookout Trail, a 0.1 mile spur that leads to (you guessed it) a lookout at the edge of a cliff where you can enjoy a view of Waimea Canyon and the ocean beyond. Touring helicopters may well be buzzing around in the wide gap below. Sharp eyed hikers may see another cliff escarpment to the left, several hundred feet lower; you will get to this area later in the hike. For hikers with small children, this is a good turnaround point – back on the main trail, your descent will continue, requiring that much more climbing on the return. The Waipo’o Falls trail continues downhill, crossing Nawaimaka Stream and passing a junction with the Black Pipe Trail. After more descending through woods and among red boulders, the trail climbs to the cliff side that was visible from the Cliff Lookout. Though wide, this rocky plateau has no railing separating hikers from the abyss. A white cross stands as a monument to this area’s potential perils. The trail continues from the lower end of the slope, soon arriving at a T-junction. The left fork heads upstream to a swimming hole while the right brings you to the top of Waipo’o Falls. A little scrambling gets you to a rest spot between the waterfall’s upper main tier (about 150 feet) and a smaller, 15-foot cascade. Depending on your threshold for risk, you can venture toward the edge of the upper tier, enjoying views of deep Waimea Canyon. Keep an eye out or a small rock “window” on the opposite wall. After enjoying the views, retrace your steps out of the stream and back up the cliff side toward the Pu’u Hinahina Lookout. While most of the elevation gain (about 800 feet) happens on the return, some hikers will undoubtedly be relieved at not having to look down.